The Rocks and Rivers. Maps of the ride showing what lies beneath the fields and tarmac (or what a ‘resting Geologist’ gets up to when it rains). 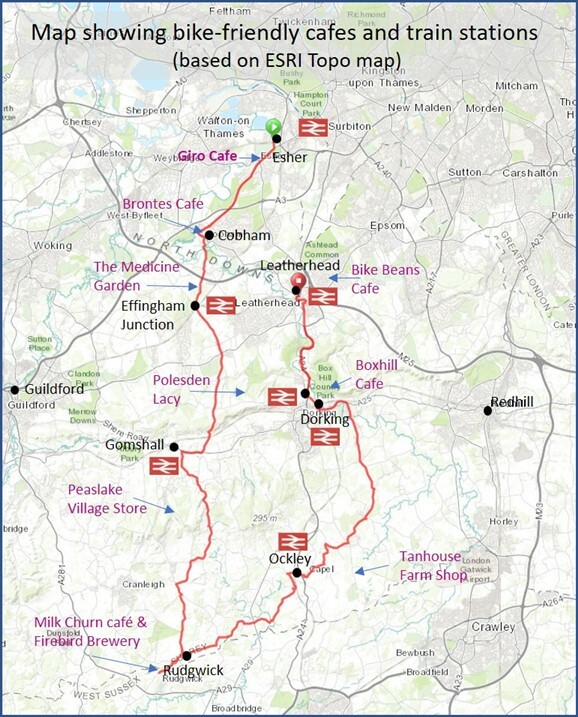 Route map with cafes and places of interest. Last Year I started riding with a women’s cycling group in West London called the Bella Velos. When I say they leave me breathless, I really mean it! Although it is for all levels of rider, the emphasis is on performance (speed, strength, endurance …), rather than a pleasant wobble along the country lanes. So it is always with a little trepidation that I set out West for a Bella Velo ride. On this occasion I was meeting up with a couple of people with whom I am going on a cycling holiday to Spain, led by Keith, who is an honorary ‘Bella’! I had planned to get the 9.07 train from Vauxhall to Cobham, but as usual SouthWest trains were completely up the spout, so I spent 10 mins working out an alternative plan. I decided to get the train to Esher and ride the ‘Portsmouth Rollers’ in the hope that my cycling legs were more reliable than SouthWest trains. Today was to be a day which revealed the worst of my slightly adhoc cycling style and it started as it meant to carry on. Ten yards from Esher station the contents of my unzipped side pocket fell onto the road, with my phone losing it’s battery and case as it hit the deck. An inauspicious start but I was heartened by the couple who stopped and asked if everything was alright, and despite a very close shave with a lorry, the phone survived. The Portsmouth Road Rollers (as the BV ladies call them), proved to be a good warm up for my legs and I arrived at Brontes Cafe with a couple of minutes to spare. Having ascertained that we were already one person down, three of us set-off to Effingham Junction at a cracking pace and by the time we got to Critten lane, my thoughts were along the lines of ….’Dear God, Why am I doing this?’. Due to a rapid increase in my metabolic rate I removed my dayglo green commuter jacket, which marginally decreased my chances of getting stopped by the style police, but with a poorly secured rack, a dirty chain and a muddy bottom bracket, I knew it was only a matter of time before I was pulled over! A steep descent down Whitedown lane and another ascent up to Holmbury St Mary, and either I had re-connected with my legs or the pace had slowed a bit. Whatever the reason, I was starting to enjoy it. London was becoming a distant memory, we’d nailed the big climbs and I was swooping down onto the Weald which always puts a smile on my face. The Milk Churn Cafe is a favourite with cyclists and an Original Charmer Melt might not be the advised fuel for a budding sportswomen like myself(! ), but it tasted pretty good. We also had a quick visit to the Firebird Brewery shop. Might have to come with a pannier next time. …….just to complete the ‘commuter look’. The route back included one of my favourite lanes, Weare Street; a tiny country road that follows a small brook and winds its way through woods past a village pond. Riding along it feels like experiencing something from a by-gone era. I was half expecting to bump into Ma Larkin from Darling Buds of May! With no let up in pace we charged on through the villages of Capel, Newdigate and Brockham, briefly onto the busy A25, skirting Dorking via Pixham Lane and along the cycling lane to the outskirts of Leatherhead. My ability to keep up a 15+ miles an hour pace for more than 3 hours is limited, so I decided to bow out at Leatherhead station. Even though there was the odd time when body, soul and bike were feeling a little ragged, I sat on the train back to Vauxhall with that fantastically smug feeling of having done something slightly outside of my comfort zone……… and surviving! A classic route for classic road-bikers! I liked the way it makes a B-line for the Surrey hills rather than looping around the suburbs of Weybridge and Woking, whilst also taking a direct route over the downs and including some decent mileage in the Weald (the bit in-between the North and South Downs). The way back includes some great small lanes and avoids re-ascending the North Downs by going via Dorking and the River Mole. There are a many ways to lengthen and shorten this ride by using the train stations along it’s route. These include Effingham Junction, Gomshall, Ockley, Dorking, West Humble and Boxhill & Leatherhead. There are also smaller tarmac roads and gravel tracks that can be included, but that’s for another day!